Commercial Satellite Launch Service Market size was valued at over USD 5 billion in 2017 and is estimated to exhibit over 2.5% CAGR from 2018 to 2024. Rising number of industry participants is boosting the commercial satellite launch service market size during the forecast period. Increasing usage of navigation facilities to locate destination across the globe will further support in industry growth. Also, rising adoption of online cab facilities together with internet services in various developed and developing nations resulted in increased usage of navigation applications, served by commercial navigation satellite. Rising urbanization and spending capacity is driving usage of mobile phones and internet. Increasing internet usage for various activities such as video streaming, online payments, and Internet of Things (IOT) plays a significant role in industry’s revenues generation over the forecast time frame. According to Global Digital Report of 2018, currently there are over 4 billion people using internet that promotes communication across the world. This increasing population of internet users is further supporting the growth of commercial satellite launch service market size over the projected time span. The U.S. Federal Aviation Administration (FAA) governs and approves commercial satellite launch services industry in the nation. It recommends required changes in the policies, plans, federal statutes, regulations, treaties, and procedures. It facilitates expansion and strengthens the required infrastructure both internationally and domestically. Moreover, it encourages and promotes commercial space launches by the private sector. Government support will strengthen industry revenue generation till 2024. Institutional bodies across the globe are encouraging and supporting initiatives to develop micro launcher related solutions. For instance, in October 2016, the European Commission announced to support innovation and research efforts to ensure its ability to anticipate and react to disruptive changes including re-usability. In addition, new uses of satellite and new markets may emerge that are currently unanticipated and will proliferate the industry size between 2018 and 2024. Scaling up of technologies will escalate the commercial satellite launch service industry share over the forecast period. Presently, financial investment remains the bottleneck for the commercial satellite launch services market size. Launch facilities, technology used, and location plays a vital role which is supported by very few countries across the globe. Launch failures, supply chain issues, and quality control problems may negatively affect the industry size over the forecast time frame. Low Earth Orbits (LEO) segment is set to pose a CAGR of over 3% from 2018 to 2024 owing to various satellites launched in the orbit for multiple applications. It includes communication application that is used widely by the customers across the globe. Development of 5G communication network will further increase penetration of satellites. This in turn will improve the segment growth over the projected time span. GEO segment is predicted to generate over USD 2 billion by 2024. Micro segment of the commercial satellite launch service market size is anticipated to witness highest growth rate over the forecast time frame. This can be credited to continuous advancements improving affordability and reliability of the launching vehicles. Major opportunity pursued by the micro-launching companies is to develop differentiating factors to capture significant market share in the satellite delivery. Small segment is predicted to account for around 29% of the industry’s revenue share over the projected time frame owing to development of launching vehicle technologies. These innovations are carried out in countries posing operational and functional orbital launching capability. Organizations in several other countries such as Brazil, Argentina, and Indonesia are also engaged in vehicle technology development thereby enhancing the industry size over the forecast period. Commercial satellite launch services are widely deployed for communication purpose in the space infrastructure. Increasing connectivity between different countries has led to enhancement of communication network across the globe. Rising usage of wireless technology escalates the demand for communication satellite. Remote sensing commercial satellite launch services segment is expected to pose over 3% CAGR over the study period owing to protection of foreign interests and national security. For instance, Commercial Remote Sensing Space Policy (CRSSP) of the U.S. provides guidance for operation of the U.S. commercial remote sensing space systems. This will foster economic growth and enable scientific & technological excellence. North America was valued at over USD 2 billion and is predicted to continue its dominance over the forecast time span as well. This dominance can be credited to the presence of industry participants and number of launching facilities. Additionally, increase in number of orbital launch sites will enhance the industry growth over the forecast period. Asia Pacific commercial satellite launch services industry is expected to witness over 2% CAGR during the forecast period. This growth can be credited to decrease in launching service cost targets offered by organizations such as ISRO present in the region. 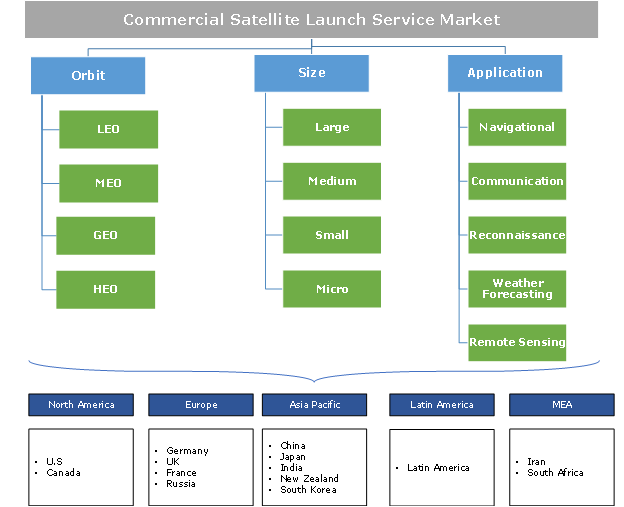 Commercial satellite launch service market players are Antrix Corporation Limited, China Aerospace Science and Technology Corporation (CASC), Arianespace SA, International Launch Services (ILS), Eurockot Launch Services, International Space Company Kosmotras, Orbital ATK Inc, Mitsubishi Heavy Industries, Ltd., Rocket Lab, Sea Launch, Starsem, Space Exploration Technologies Corp. and United Launch Alliance (ULA). Companies are undergoing long term agreements to enhance their industry share. For instance, in 2015, Antrix Corporation Limited made a contract with Canadian government to launch Maritime Monitoring & Messaging Micro Satellite (M3M). In addition, companies are strengthening their R&D activities for technology improvements. For instance, SapceX and ISRO are working on vehicle reusability, modularity, and cost reduction. Satellite operators usually have agreements with the commercial satellite launch service market providers. In general, the launch vehicles are designed for one-time usage however, ongoing developments for reusability will enhance the industry size. Development of orbital launch sites across the globe will enhance the commercial satellite launch service market size over the study time frame.